Aquarius sensed energy emitted from the ocean surface, which is measured as an equivalent "brightness" temperature in Kelvin. To achieve the mission's science goals, Aquarius detected change in brightness temperature of about 0.1 Kelvin. This was achieved by careful instrument design (e.g., thermal control), data averaging, and avoidance and/or mitigation of contamination sources such as radiation from the Sun. The elements outlined below are key to making this very challenging measurement possible. Aquarius was in a seven-day repeat, sun-synchronous orbit that crossed the equator at 6:00 AM during its descending passes. It continually sampled on the dark side of the day/night terminator to minimize reflected radiation and sun glint (i.e., backscatter). A visualization of Aquarius data swaths (at left) over a 7-day period focuses on contiguous data swaths over one section of the earth. The three individual beams are represented by one wide oval with a total beam with of 390 km (242 miles). Although the actual swaths collected data in a continuous ribbon, each oval shows the footprint at 1-minute intervals. 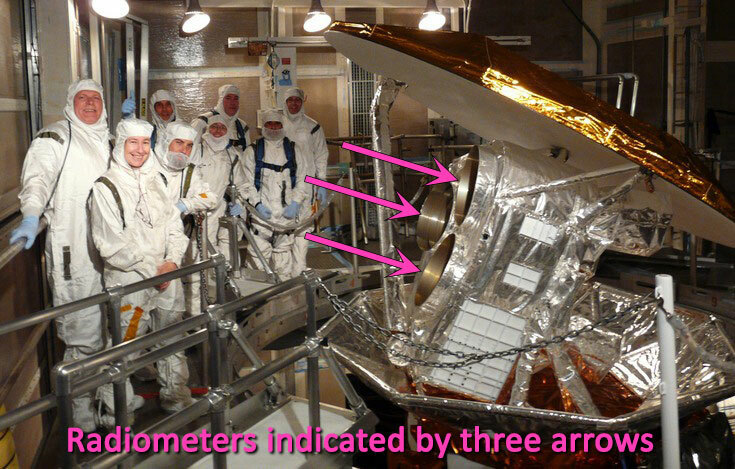 Three onboard radiometers shared a common 2.5 meter (8.2 feet) diameter antenna reflector. Together, the three radiometers continuously imaged a 390 kilometer (242 mile) swath roughly perpendicular to the observatory's heading. 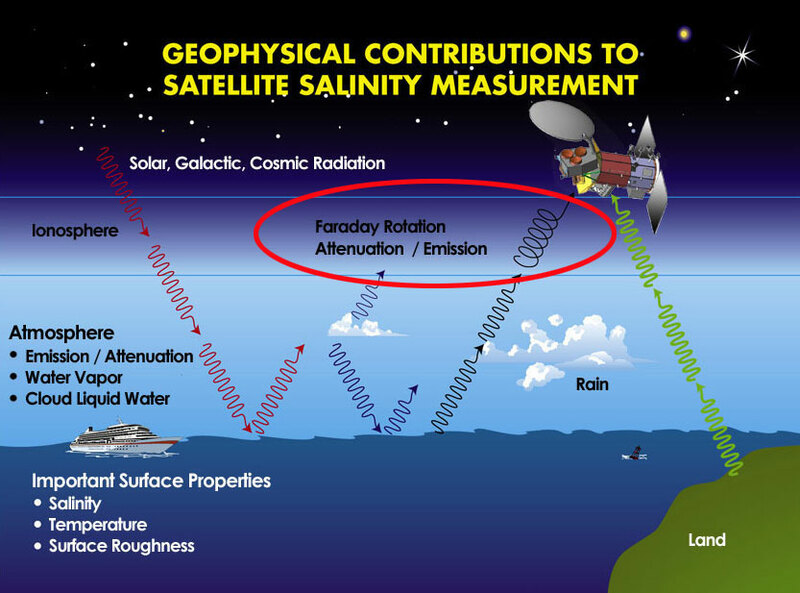 Aquarius radiometers sampled rapidly (i.e., 10 microseconds per data sample) to help with the detection and mitigation of radio frequency interference (RFI). Ironically, RFI is a problem that shouldn't have existed for Aquarius, since its radiometers operate at a band centered at 1.41 GHz which is "protected" for radio astronomy. Employing this frequency permitted Aquarius to detect the small brightness temperature signals naturally emitted from Earth's surface. However, even very weak out-of-band signals from human-made sources such as communication and air traffic control radar could overwhelm the natural signal that Aquarius was designed to measure. Aquarius radiometers measured both vertical and horizontal polarizations of natural L-band emissions from Earth's surface. The third Stokes parameter is a correlation between these two polarizations. The third Stokes parameter is used to correct for Faraday rotation, a change in the orientation of polarization of electromagnetic radiation that occurs in the ionosphere, after waves have propagated from Earth's surface and before reaching the satellite instrument. 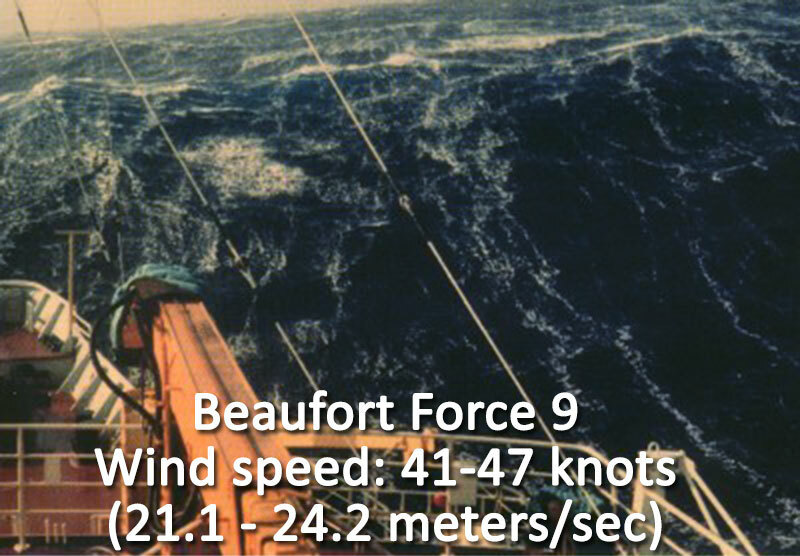 Aquarius had an onboard scatterometer with the same footprint as its radiometers. 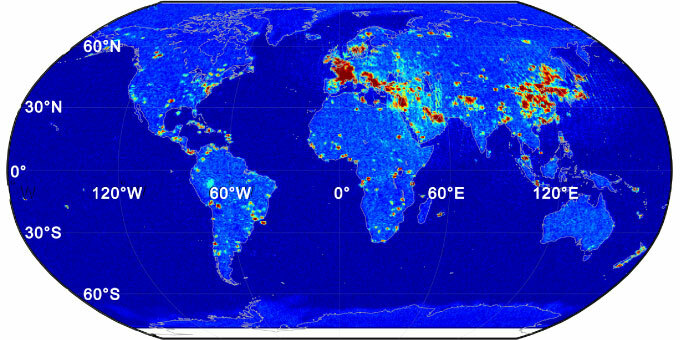 Scatterometers operate by transmitting a pulse of microwave energy towards Earth's surface and measuring the reflected energy, known as backscatter. In general, rougher ocean conditions will scatter more energy than smooth, more reflective mirror-like ocean surfaces. 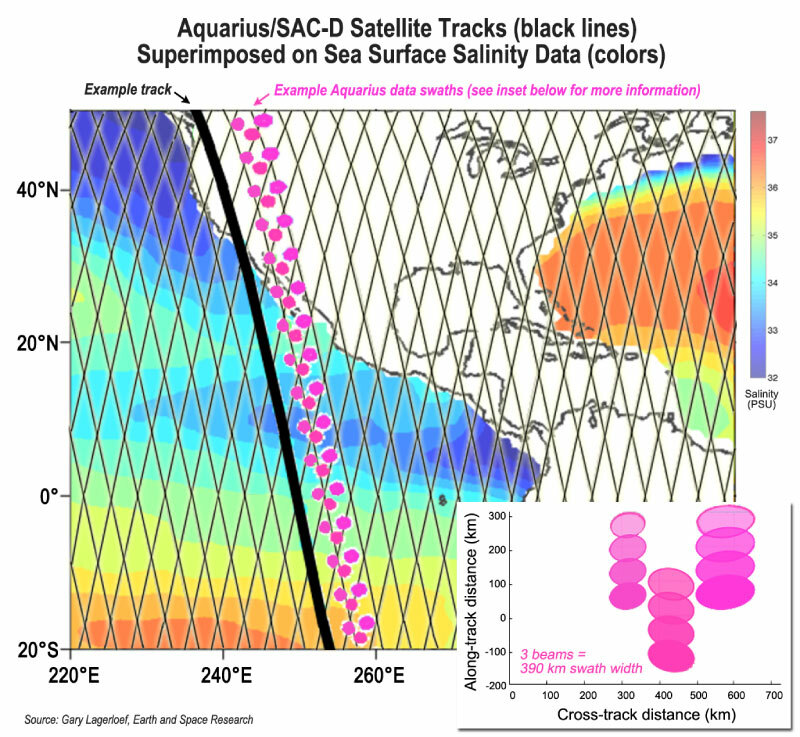 Thus scatterometer data can help provide a correction for ocean surface roughness, which is the largest source of error for the salinity measurements of Aquarius.